This past weekend my husband & I (Lauren) went down to Port Aransas, Texas, where Hurricane Harvey had recently done some serious damage. We volunteered to help with clean up and were assigned to a residential home. The owner of the house greeted us with kindness, but also with a mask over her face. She was taking on the daunting task of cleaning out her refrigerator and freezer. Both appliances had been sitting in her home for about a week, without any power but completely full of food. The smell of course was terrible, and the loss of food is always sad – but she was mostly concerned about getting it cleaned really well so that she could use it again. Last year, I (Erin) had the unfortunate experience of losing power to the outlets in our garage, and therefore lost all the food in our deep freezer. We weren’t aware of the loss of power for a few days, and then the smell started and that’s what cued us in to the power outage. The smell was horrendous. So horrendous that it induced massive dry heaves from my husband. But, I managed to salvage the deep freezer and it’s like nothing ever happened. 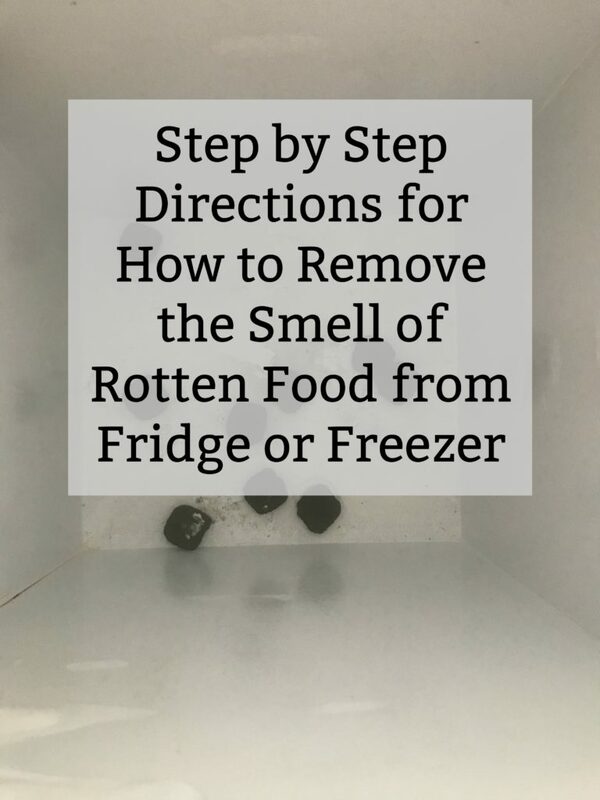 Before I share the practical tips of how to remove the smell, I want to encourage you to practice “mouth breathing” before you clean out the appliance. This is what allowed me to get the work done without losing my lunch. You will NOT be able to do this dirty work without mouth breathing. The stench will be intense enough to activate your gag reflex, just from the smell. It’s crucial that you breath through your mouth. Use a clothespin, essential oil, smelly salts, if you need to. But I was able to do all this work while just breathing through my mouth…and taking a few breaks. 1. Unplug and take the appliance outside. 2. Gather cleaning supplies – trash bags/disposable container, disinfectant, paper towels, gloves for hands, face mask, vinegar, baking soda and charcoal. 3. Put gloves on hand and mask on face. 4. Remove all food and containers and throw into trash bags or disposable container, seal tightly and discard. 5. Carefully tilt the appliance slightly (without disrupting the coolant/refrigerant). Spray the inside down with water/hose. 6. Take a break, or three. Go far away from the appliance and take a few deep breaths. 7. Wipe down the interior of the appliance with disinfectant wipes/paper towels. 8. If mold is present, wipe down with vinegar and paper towel to remove and kill it. 9. Wipe down with disinfectant wipes/paper towels again. 10. Sprinkle baking soda all over the interior of the appliance, including ceiling and walls. Place 20 charcoal pieces into the shelves, base of the appliance. Leave the appliance outside or in the garage and leave the doors open for 1 week. 11. After 1 week, remove the charcoal and discard. Wipe out the baking soda with another disinfectant wipe/paper towels. 12. 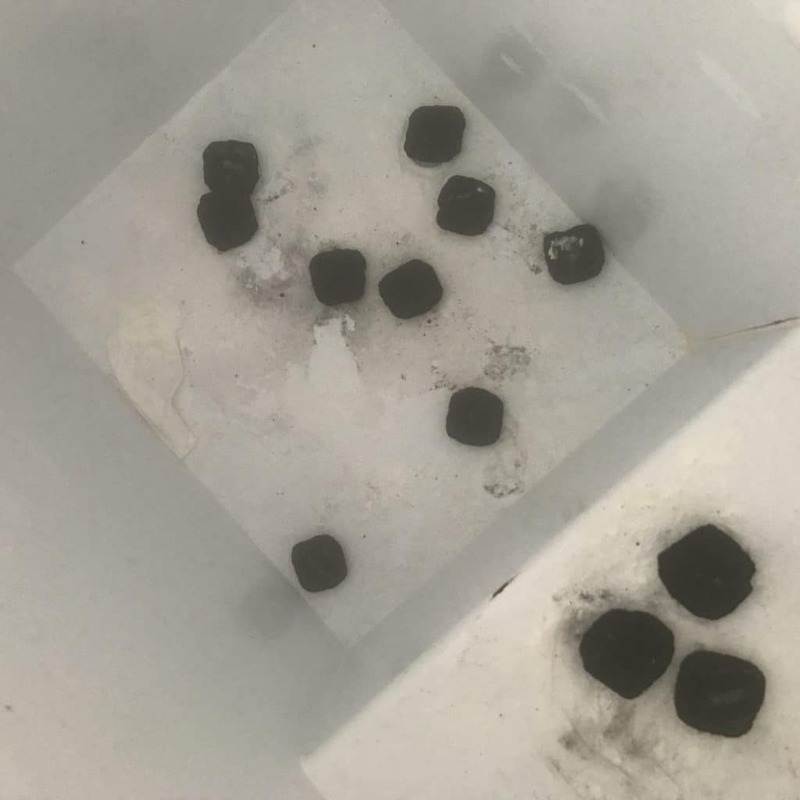 Repeat with adding baking soda all over the interior of the appliance and place 20 pieces of charcoal inside and close the doors. Leave for 1 week. 13. After 1 week, check for residual smells and repeat #12 again, if needed. 14. Once smell is gone, remove all charcoal and wipe out the baking soda. Plug in and begin using again. With a little patience, and a lot of baking soda and charcoal, your appliance can smell good again!